RITM Australia invites you to attend the 2019 SCENAR Professional Conference which is just 4 weeks away! The Conference will take place on the 5th, 6th, 7th and 8th of April 2019 at the Royal on the Park Hotel and Suits, Brisbane. 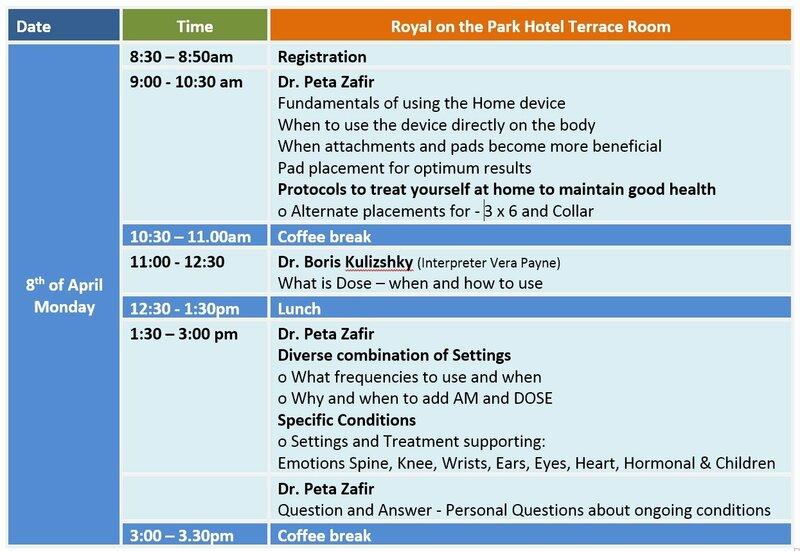 The theme this year is “Quick and Easy Treatment techniques for Fast Pain Relief”, suitable for beginner and advanced SCENAR Practitioners. Book now to confirm as registrations are closing soon. Become a member of the SCENAR Practitioners Association (SPA) to qualify for a Conference REBATE! SPA is offering a $120 rebate for current Members of SPA or Pro Rata rate of $10 per month for newly signed up members since July 2018.
and $100 rebate for current Associate members of SPA or Pro Rata rate of $8 per month. Please submit a copy of your conference fee receipt from RITM Australia and bank details to admin@scenarassociation.org.au. If you are not a member yet – sign up NOW https://scenarassociation.org.au/join-now/ – you could still get up to a $50 rebate! For busy Practitioners who cannot afford the time to attend the full Conference we are releasing days passes for $480 per day.